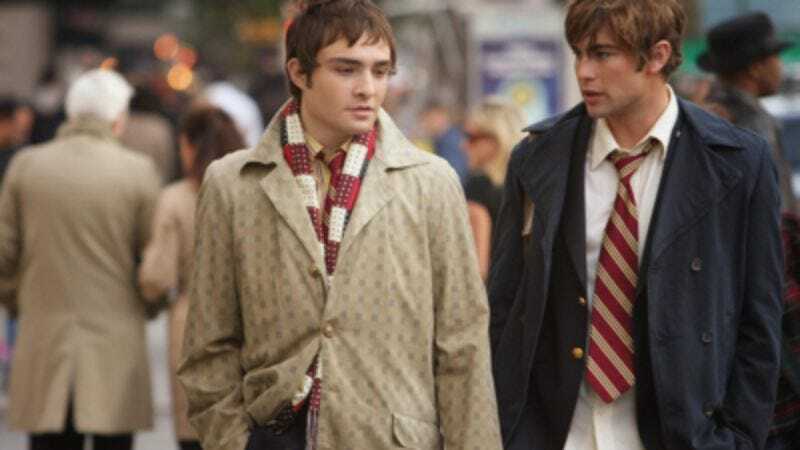 I’ve said it before, but it bears repeating: Gossip Girl needs evil like a flower needs the rain. As I suspected, last week’s hideous Thanksgiving episode was an anomaly mostly because of the holiday: Thanksgiving is supposed to be about family and togetherness, after all, so it was the antithesis of the petty manipulation and dysfunction that makes this show purr. The moment it became clear that “Hi, Society” was going to center around a cotillion—that deliciously antiquated ritual left over from the earliest days of New York high society—I had a feeling the show would find itself again. And when committee chair Lily barked on the phone, “Those brands I listed are the keys to her happiness,” that officially sealed the deal. The big star of tonight’s hour was Serena’s beloved Grandma CeCe, a character that would have been perfect for Angela Lansbury circa The Manchurian Candidate. So prim, so refined, so wonderfully malevolent, she seems to lurk around every corner and drinks cocktails like rocket fuel, never letting her ice to get too lonely. When CeCe persuaded Lily to force her daughter to attend the debutante ball by telling her she had lung cancer, I wrote in my notes, “Is CeCe making up cancer? Please make it so.” And it didn’t take long to realize that she’s exactly the type of person who would make up a terminal illness just to get what she wants. For a master manipulator, CeCe overplays her hand a little bit by going after the Humphrey men, who pride themselves on unshakable (and yes, occasionally dull) integrity. But those two scenes are dynamite anyway, especially the first one with Dan, which preys on his insecurities in a way that may not work in the short term, but will haunt him over time. He doesn’t fit into Serena’s world; for just one example, look no further than tonight’s amazing exchange over whether or not Dubai is overrated, which is the sort of discussion UES kids can have without a shred of self-awareness. As CeCe astutely points out, Dan is the sort of fellow who uses a dessert fork for his entrée, and she’s right to believe he simply won’t feel comfortable in Serena’s world over the long haul. The speech doesn’t force Dan to step away—in fact, it backfires, because Dan naturally doesn’t like to get pushed around—but CeCe has planted a seed of doubt in his head and I suspect it will flourish in due time. This week, the writers also did an excellent job playing with the Blair/Nate/Chuck love triangle while still keeping the Blair-Chuck hookup a secret. I’m not entirely sold on Nate’s about-face with regard to Blair, but it made for some juicy intrigue as Blair continued her dalliance with Chuck while slowly letting Nate back into her life. Chuck goes from the proud, devilish peacock at the beginning of the episode (responding to Nate cooing about how Blair look: “Yes, she does have a glow about her”) to the spurned, vengeful lover at the end. His plot to give Nate the impression that evil cad Carter—who will be henceforth known as the Into The Wild Guy, based on his adventures off the UES grid—was a good one, but it didn’t have the end effect he wanted. However, it had the effect I wanted, because somebody wound up getting cold-cocked. I’m not sure how much attention Josh Schwartz pays to Gossip Girl now that he has NBC's Chuck running at the same time, but I’d like to believe the punchouts are his doing. The only real complaint I have with this episode is the fairly graceless way Jenny’s descent into snobbery was handled. I think it’s a good idea to have this very young girl poised between two different worlds—one that buys its extravagant shoes from Saks and the one she has the economic misfortune to occupy. Jenny’s flirtation with Blair is a temptation to the dark side that a girl of her age and insecurity would find hard to resist, but I wish it didn’t boil down to a fight with RBW and I wish Jenny showed a little of the independent-mindedness that helped her survive Blair’s slumber party ambush several weeks ago. By the end of the episode, it looked like Jenny was unconvinced by her mother’s scolding, which can only be good for a show that’s firmly back in its element. • Blair: “You almost made a fool of me in front of the New York Times!” She wouldn’t be the first, I suppose. • “Ms. Van der Woodsen hopes to bed as many billionaires as she can…” Well-played, Serena. All irony aside, I’d bet dollars-to-donuts that Serena will spend more of her life bedding billionaires than Blair will working for children’s charities. • Chuck responds to the Blair/Nate hook-up by fleeing to the airport?! That’s not the sniveling, conniving Chuck we know and don’t really want to admit we love, is it? • Please never get cancer for real, Grandma CeCe. Whenever the show needs a shot in the arm, you need to be around to take the call.